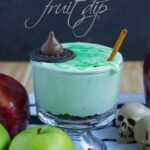 This Melted Witch Chocolate Chip Cream Cheese Fruit Dip is thee PERFECT dip to have at your Halloween Party! 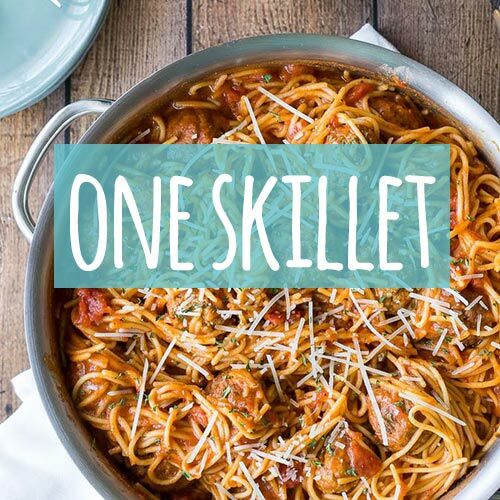 It’s super easy and quick to make, it tastes PHENOMENAL, and everyone will get a kick out of it! First of all, I know what you’re thinking- does this have mint in it? NO, it does not. 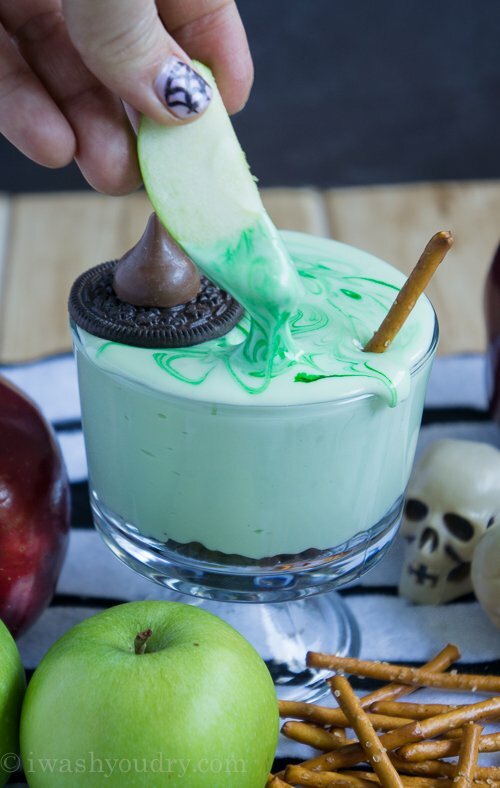 It’s simply green because I took a witch and boiled her down into a deliciously sweet dip that goes well with apples, pretzels, graham crackers, strawberries, etc, etc. When my oldest daughter came home from school and saw this dip on the counter she scrunched up her nose and asked me, “What is THAT? !” in the most disgusted voice imaginable. 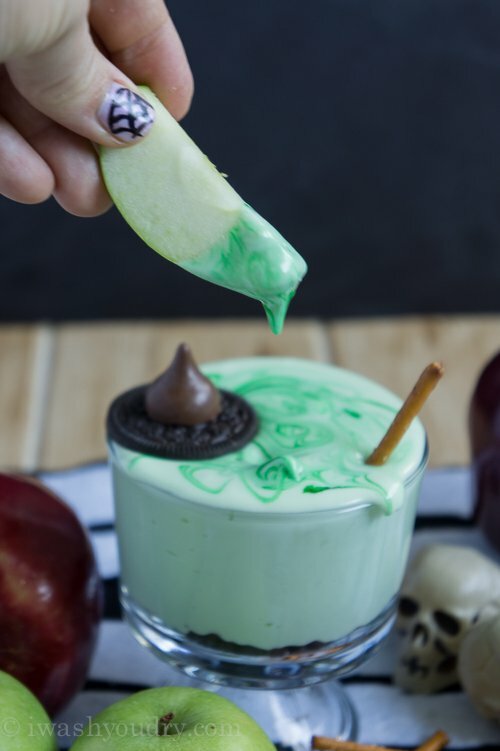 I insisted she try it, so she grabbed an apple slice and dipped it into the green goo. She took a bite, and the questionable look on her face quickly disappeared and was replaced with a look of pure delight. 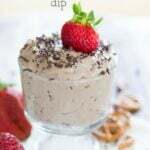 The dip is made with cream cheese, a little bit of sweetened condensed milk to give it that silky texture, a tiny bit of powdered sugar for a touch of sweetness, and a dash of vanilla for some added balance. I dropped in a little green food coloring to give it that lovely witch hue. So fun! In the picture, you can see there are mini chocolate chips at the bottom of the glass, those resemble mini witch hats! I later stirred them into the whole dip and WOW, it really completed the dip! In fact, my kids loved this dip so much that they requested a little container of it to accompany their apple slices in their school lunches. What a great way to add a little more dairy into their day!! at first glance- it’s questionable. at first taste- it’s irresistible. 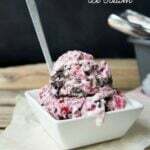 Melted Witch Chocolate Chip Cream Cheese Fruit Dip is made with cream cheese, a little bit of sweetened condensed milk to give it that silky texture, a tiny bit of powdered sugar for a touch of sweetness, and a dash of vanilla for some added balance. In a large bowl beat the cream cheese with a mixer until light and fluffy (no longer clumpy), then slowly add the sweetened condensed milk. Beat until smooth. Add the powdered sugar and vanilla, mix until blended. 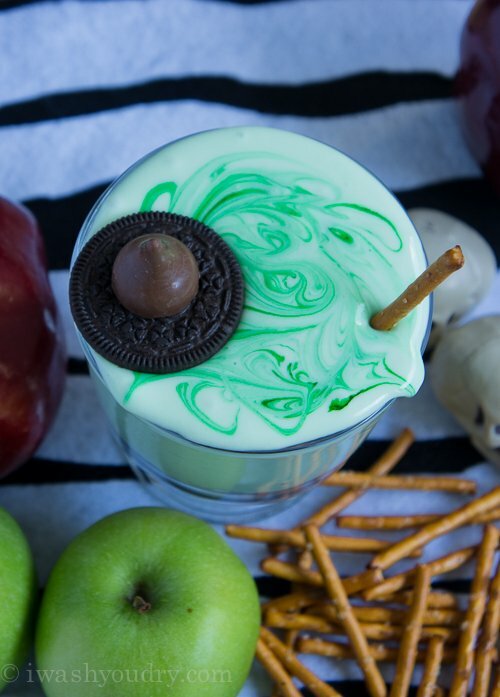 Drop in 5-6 drops of green food coloring and mix until fully incorporated. Fold in the mini chocolate chips. Pour into serving dish. 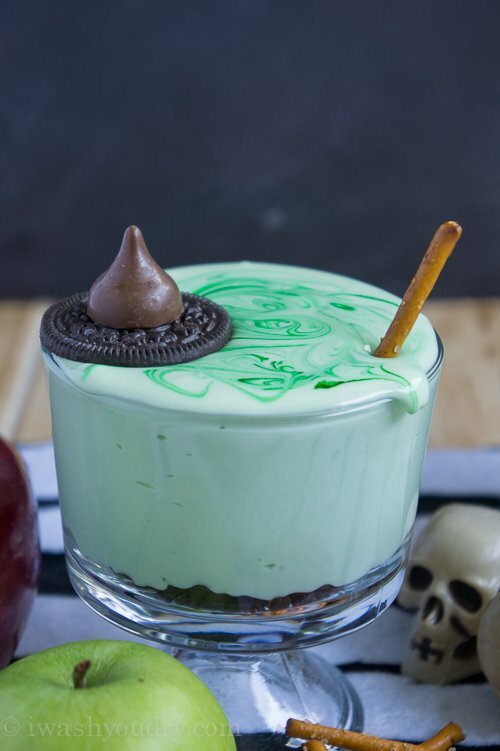 If desired, drop a couple dots of green food coloring on top and use a toothpick to swirl around to give it that “melted witch” look. Place half of an Oreo cookie on top, then top that with the Hershey’s Kiss so it looks like a witches hat. 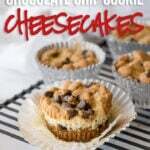 Serve with fruit slices, graham crackers and/or pretzels. Store in an air tight container in the fridge. Enjoy! 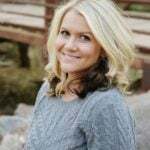 disclaimer: This post is in partnership with Arizona Milk Producers. Reminding you how fun it is to include dairy into your day. All thoughts and opinions are my own. 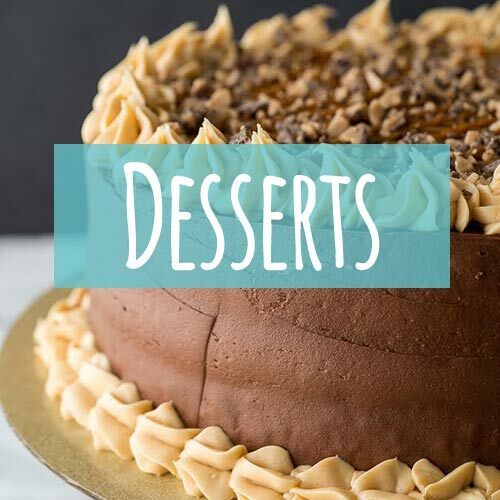 That sounds awfully sweet, even for my sweet tooth. I wonder if it would be just as good without the powdered sugar, or by cutting the powdered sugar down some? It looks so cool, though, and I would have expected mint from the look of it! Don’t worry, it’s really not too overly sweet. If you wanted you could reduce the powdered sugar and sweetened condensed milk a little bit. If you find it’s not sweet enough you can always add it back in. 🙂 Hope you enjoy it! I know that I use 1 can of sweetened condensed milk, about 8 oz., for 10 cups of iced coffee, and it’s almost too sweet for me. I’ll try it with less, and add as I think I need to. That is like, the best dip ever. AND the best Halloween treat! Haha! I love it! 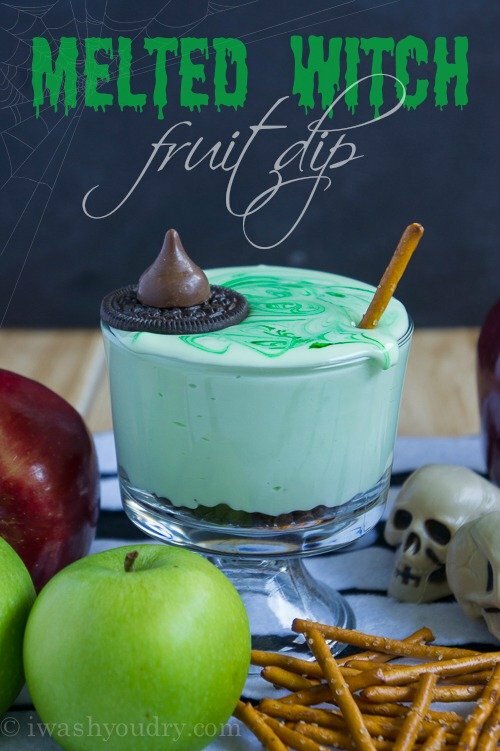 what a fun and creative dip for Halloween parties!